ArtsEmerson Presents The Infernal Comedy: Confessions of a Serial Killer "
Of The Infernal Comedy: Confessions of a Serial Killer"
The fall season at ArtsEmerson continues with the U.S. premiere of "The Infernal Comedy: Confessions of a Serial Killer" starring John Malkovich for two performances only on Sept. 29 and 30 at the Cutler Majestic Theatre. A cross between chilling crime drama and Baroque opera with a live orchestra on period instruments, "The Infernal Comedy " is based on the true story of twice-imprisoned serial killer Jack Unterweger (played by Malkovich). Unterweger, who was sentenced to life in prison in 1976 for murdering a young girl, became a literary celebrity with the publication of his autobiography, Purgatory. Considered a model of rehabilitation, he was paroled in 1990 -- only to go on to murder 11 more women on two continents. Mysteriously back from the grave for an autobiographical book tour, the notorious womanizer oozes disconcerting charm as he narrates his sordid and shocking history. Each chapter concludes with an aria -- eight in all -- from Gluck, Mozart, Haydn, Vivaldi and more, sung live by two sopranos, both tempting prospects for Unterweger’s bloodlust. The narrative is told through monologues which are illustrated by and juxtaposed with the music, embodying the emotions they explore -- joy, hatred, love, grief and desire. Musica Angelica Baroque Orchestra Los Angeles performs under their conductor Martin Haselböck. The sopranos’ (Sophie Klußmann and Claire Meghnagi) performances provide an inspired counterpoint, providing both a soundtrack to and a deliciously ironic commentary on Unterweger’s disturbing confessions. At times darkly comic, at other times bleak and brutal, "The Infernal Comedy " is an intriguing and innovative approach to delving into the twisted mind of, as Malkovich puts it, “a bad, bad guy.” Recommended for ages 15 and up. For tickets to "The Infernal Comedy: Confessions of a Serial Killer " call 617-824-8400 or visit artsemerson.org. John Malkovich has appeared in more than 65 films. For his work on stage and screen, he has been awarded an Obie ("True West"), an Emmy ("Death of a Salesman") and been nominated for an Academy Award ("Places in the Heart"). He is perhaps best known for the 1999 film "Being John Malkovich." 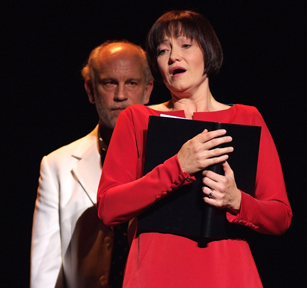 To celebrate Malkovich’s appearance on the ArtsEmerson stage, four of the actor’s notable screen performances will be highlighted by ArtsEmerson. Deviations from the popular imagination’s conception of typical Malkovich casting (menacing, often dangerous characters), these critically acclaimed films demonstrate his excellence embodying intelligent, non-sinister roles as well as his varied collaborations with directors, within both Hollywood and the more rarefied world of European art cinema. Friday, September 23, 6 p.m.
Sunday, September 25, 2 p.m.
"A Talking Picture (Um filme falado)"
Friday, September 23, 8:45 p.m.
Saturday, September 24, 6 p.m.
"Empire of the Sun "
Saturday, September 24, 2 p.m.
Sunday, September 25, 6 p.m. Films will be presented at The Paramount Center, 559 Washington Street, in the Bright Family Screening Room. For film tickets, call 617-824-8400 or visit artsemerson.org.